I love me a good transformation especially when it comes to therapy website redesigns. As a designer of private practice websites, I love when a therapists comes to me with an outdated website with goals to grow their business. My creative juices start flowing as I dissect why their current website isn’t helping them reach said goals and what can be done to change that. That was definitely the case with Dr. Jarod Carter. 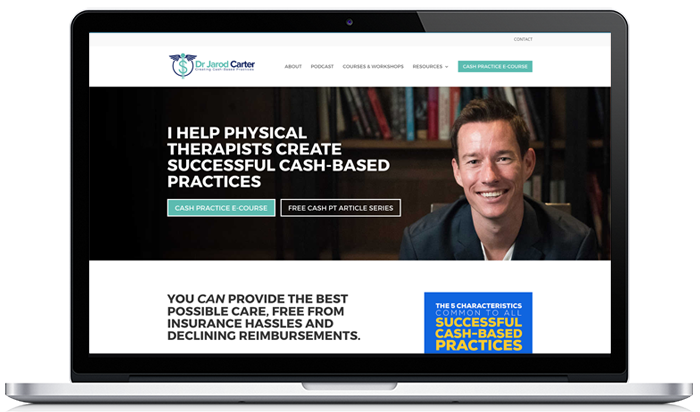 Jarod and I first worked together to redesign the website for his cash pay physical therapy practice, which you can read about here. 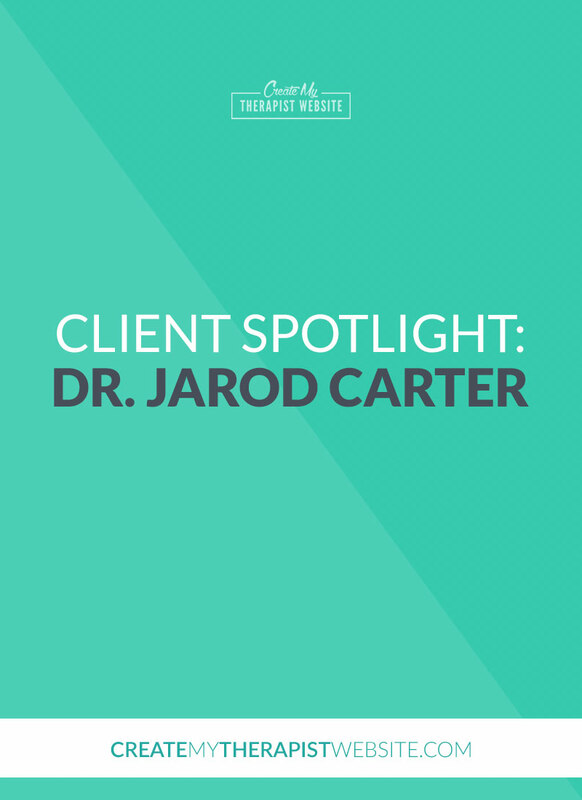 Jarod has built quite the community and following as an expert in marketing for cash pay physical therapists. With a thriving podcast and extensive content, Jarod is a go-to source for his audience. When he approached me about redesigning his personal brand website, some growth was happening in his business, but it was clear that his website wasn’t doing him any favors. Even Jarod would admit, this website was extremely outdated and needed to overhauled from the ground up. It was very text heavy and focused on the content, more like a library. Lots of great content, but not very inspiring, right? More like a place to do research instead of doing business, the opposite of Jarod’s goals for his business. Because of Dr. Jarod’s desire for growth in his business (both revenue and impact) it was important to clearly define the main goal of his new website. Having a podcast and amazing free resources for his audience meant that he was poised to really grow his email list in order to market his products and services well into the future. So the main goal of the new website? Increase conversions of people signing up for his email list. Knowing exactly what we wanted his users to do meant that I could be very strategic with the design of his new website. It meant thinking of new ways and opportunities for people to opt into his email list. We put simple opt in banners in prime spots on his website. We utilized third-party plugins like Opt In Monster to create dynamic popups that appear to certain users, especially those visiting the website for the first time. An I’m happy to say that since launching the website, Jarod’s email list has been growing at great rates than before. Quite the difference from the black and white, text heavy blog feel of the old website, right? Another aspect of this project that helped us reach Jarod’s goals of a modern website that reeks of authority within his niche was Jarod’s investment in good photography. From the first moment a user lands on his website, you get a feeling of professionalism as well as connection when you see Jarod’s face. His about page does a great job making him look professional and approachable with photos of his family. As a website designer, this made my heart happy. I understand that a custom website is a huge investment in your private practice, but if you’re serious about growth, investing in photography and possibly copywriting IS going to give you that professional and creative edge. 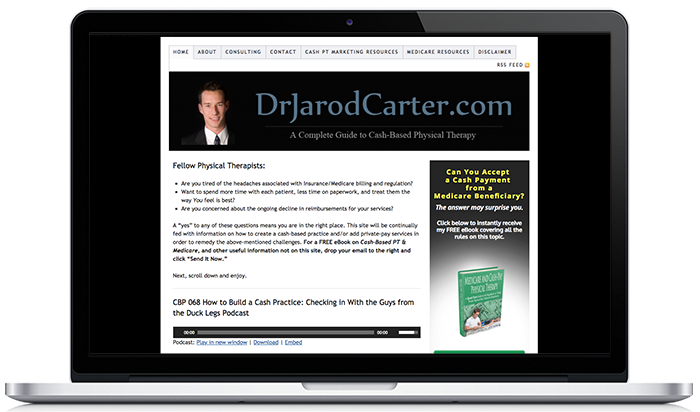 So check out the new drjarodcarter.com, especially if you’re a physical therapist! Are You Ready To Redesign Your Website? If your outdated or ugly website is hurting the growth of your private practice and you’re ready to make a change. I’d love to talk. Just fill out the form on this page and we can schedule your free 30-minute consultation. The best part of my job is that I get to meet amazing therapists, counselors, coaches and psychologists doing amazing work. Recently I had the pleasure of working with Karen Midyet to launch her new coaching business, Coaching Aging Adults. In this article I’ll take you behind the scenes of the work we did together to create the website for her new business. What was so exciting about Karen’s project to me was that she wasn’t just refreshing an old website, but creating an entirely new business! 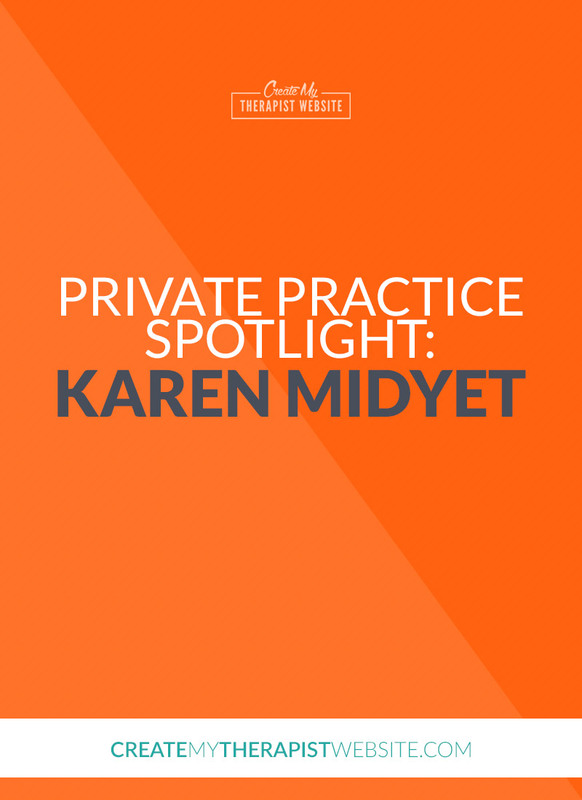 Karen had built a great private practice, Colorado Senior Counseling, serving her local population of adults facing the challenges of aging, working with caregivers and their transition to retirement. She’s collected a wealth of information and resources helpful to the aging population as well as for caregivers who work with older adults. It’s time for Karen to share those resources with the world! Now, she has a vision for what she wants her business to look life for the future. Karen decided she wanted to reach a larger population with resources and coaching services and be more selective about how she spent her time in her business as she gets older. She also has a vision of starting a podcast and offering online training. In order to do that, she launched a new business, Coaching Aging Adults, and has begun the work of building a new online platform for herself. When Karen and I first spoke, we discussed the challenges she’d face in creating an online platform and how we could work together to meet those challenges head on. Aging adults, caregivers, retirees and upcoming retirees, as well as other businesses she can consult with about the challenges associated with aging. This meant that the majority of people using this new website would adults over 50 years of age. So we had to be sensitive to this population and make sure the design would help them as they navigate the website and not hinder them from being able to get the resources they seek. A key piece of our research for this project was a resource guide from the National Institute on Aging containing research on the key factors of making a website senior friendly. We knew that a large part of Karen’s audience may be reading with impaired vision in their older age. One thing we made sure to do was always use high-contrast color combinations (with backgrounds and text) to make sure text was easy to read. Like the previous point, we needed to ensure that text was easy to read. Another way to do this was to use larger font sizes all around. In the Divi settings, we set the body font size to 18 pixels. The average text size for a typical website is 16 pixels. This would ensure text would be easy to read on the page. Another way we made the website easier for the older demographic of users was to make sure that all buttons and clickable areas had plenty of space. This will make clicking on those objects much easier for those with aging eyes or those not as experienced on a mouse like younger generations are. Notice the large font size and overall size of the buttons. This makes clicking so much easier! Most other websites I’ve worked on targeted much younger demographics. A younger audience may be more used to button shapes or intuitively recognize links when they see them. With the older demographic, we made sure to use clear instructions so that users would know what we were asking them to do and how to move to the next step. In order to grow the reach of Coaching Aging Adults in the coming years, Karen needed a website that would be homebase for her business that would grow along with her business. One of the best assets Karen has for her audience is her vast collection of resources. And, as time goes on, Karen will be adding her own articles via her blog. So one of the main challenges for this new website was to allow website visitors to see all these great resources and find them quickly. So at any time, visitors can easily find what they’re looking for. 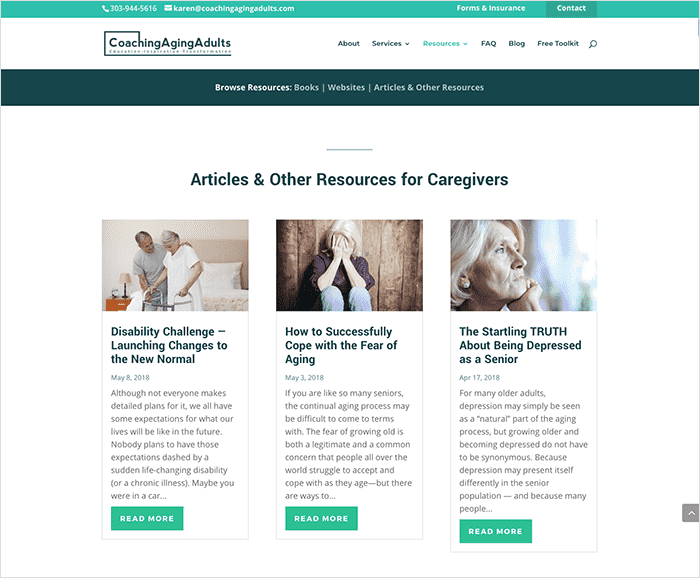 Another way we made sure people could access the growing list of resources on the Coaching Aging Adults website was to create specific pages for each topic. Not only would these pages be extremely valuable to Karen’s audience, but it would also help her grow some passive income through affiliate marketing of products that her visitors may find helpful. 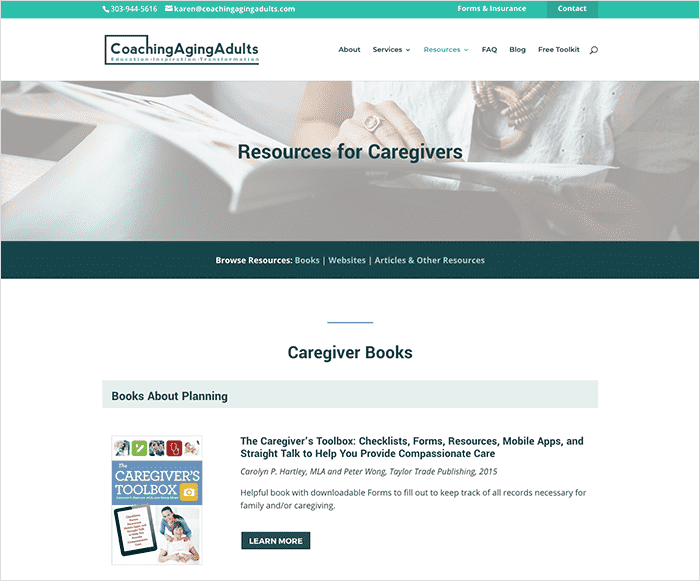 Because these resource pages will grow over time and be a bookmarkable page for those who take care of an aging family member or friend, we had to make them easy to navigate. So, at the beginning of each section, we placed a navigation bar across the page, so an any time, the user could jump between the sections of the long scrolling page. Another important challenge to these pages: they had to be easy to edit and add new content. 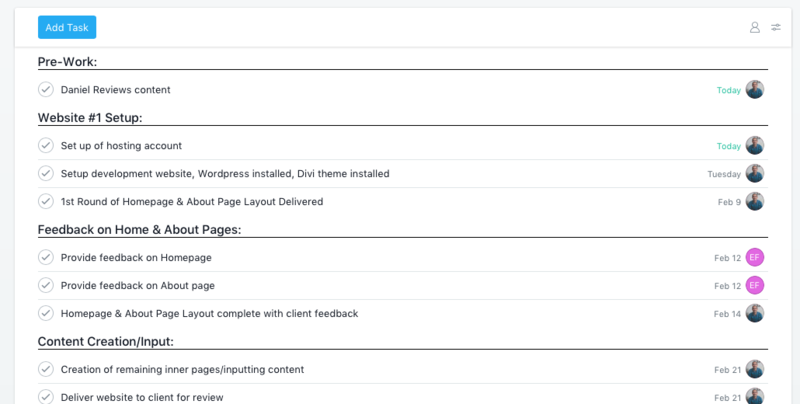 Luckily, the Divi WordPress Theme allows you to duplicate entire sections at the push of a button. So adding a new book in the future will be easy for Karen and her team. The last feature I’d like to highlight on these resource pages is how each one will feature Karen’s growing list of her own blog posts. As the website grows in the number of articles, the more recent these pages will be and there will be more opportunities for website visitors to stay longer on the website. 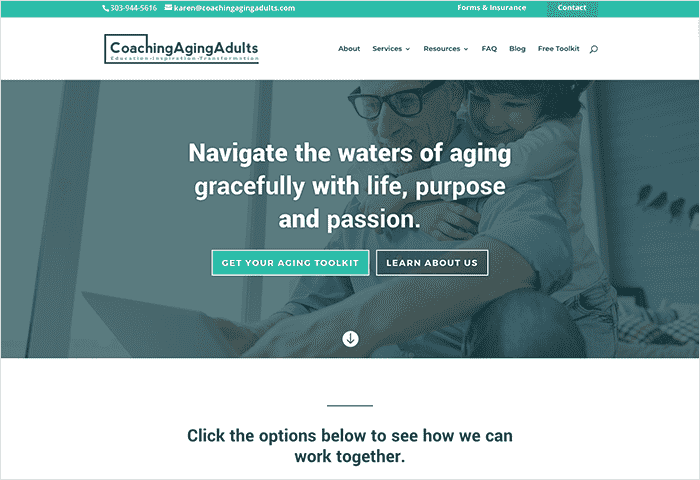 I hope you enjoyed taking a little peek behind the scenes of the process behind coachingagingadults.com. This project was a true collaboration and both Karen and I are excited about the results and looking forward to seeing how this new website serves her new business. If you’re curious about what a new website could do for your private practice or you have a vision for your website you just need executed, feel free to schedule a free consultation here. This is the final article in our series on what to expect when working with a website designer to build a website for your private practice. In this article, I’ll share what you can expect after your website has been launched and how you can make the most out of this new marketing asset of yours. This isn’t really the “end” of your website project… the fun has really just begun. Because if you JUST build it, no one will JUST come. There’s work to be done to make sure that this investment into your marketing truly pays off. As your project nears the end of this phase, your designer may begin to gather some resources for you smoothly hand off your website and equip you to use your website. Because I use the Divi WordPress theme to create all my client’s websites, I can save page layouts for my clients to use in the future. Now that the website has been launched, I’ll save the latest versions of the page layouts. 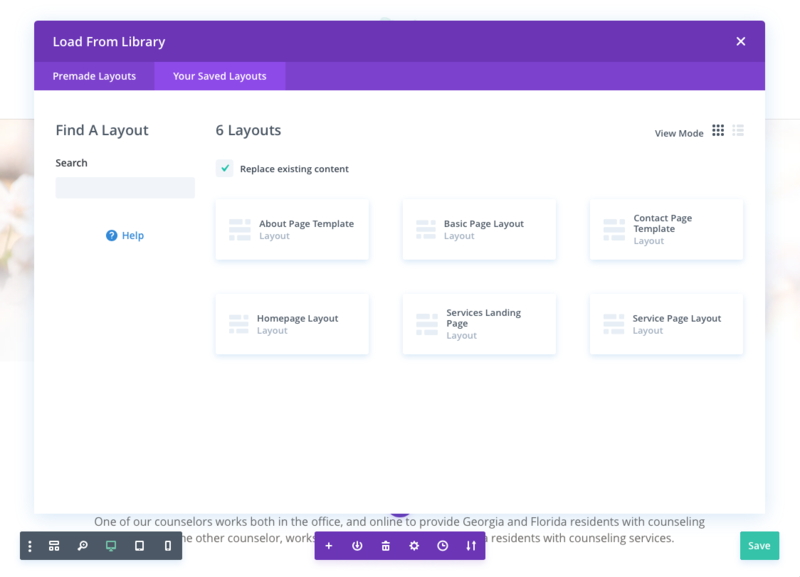 Now they’ll be able to add new pages, with a consistent design, all on their own. Another thing I like to do for my clients is create a PDF resource with information about using their new website. Inside, I’ll include their WordPress login credentials, the color palette used on the website should they want to use them in other marketing materials, a link to their personal training video for making updates to the website, other tutorials and other helpful resources. This is a helpful PDF that my clients can refer to in the future as a reference for using their website. Your website should be an ever-changing marketing asset to your business. Adding new content over time is a sure-fire way to improve your traffic and help your website rank on Google for various keywords. In order to add content, you’re going to have to know how to make updates to your website. When I work with my clients to build their websites, each project culminates in a 1-hour video training session. I’ll share my screen with them via a Zoom meeting and walk them through the process of editing existing content and adding new pages and blog posts. I’ll record this video and include the link in their PDF Thank You packet I mentioned above. For those clients who are not familiar with WordPress, I’ll include free access to A Little Course About WordPress, my beginner WordPress course, to help them get familiar with how their new website is built and where to go to edit their website. At this time, the baton has been passed and you can begin to explore your new private practice website and make changes to the content. I always encourage folks to create a new web page and just have fun playing with the Divi builder to change images and content. Once they get a feel for adding new content, they can begin to create more pages and add blog posts to their website. One of the biggest differences between website-builders like Squarespace and WordPress, is that with WordPress, you are responsible for keeping your website files updated and secure. Not performing regular updates to your WordPress files is one of the main ways hackers can gain control of your website and leave you empty handed. To make sure the shiny new website you invested in stays secure and working properly, you’ll want to apply updates at least every few weeks. At Create My Therapist Website, we include 2 months of our maintenance service completely free after your website is launched, so you don’t even have to worry about it. To learn more about the importance of keeping your WordPress website updated and how to do it, check out this post here. The final step in working with a designer to build a great private practice website that will actually impact your business is to get traffic to show up to your website. The more traffic that comes to your website, the greater the chances of clients reaching out to you for help with their challenges. The more people that reach out, the more can become paying clients. This step in the process is an ongoing one and involves a little understanding about what you enjoy doing when it comes to marketing your private practice. Will you write blog posts to help boost your search engine optimization (SEO) and showcase your expertise? Will you hire someone to create cornerstone content that’s optimized for search engines? Maybe you’ll start a podcast and publish the episodes on your website. There’s also a number of things you can do OFF of your website in order to drive traffic, such as writing guest articles for other websites (with a link back to your own), posting content on social media channels, or using Google and Facebook ads. Try not to to overwhelm yourself with all these options, but try a couple, see what you enjoy and then make it a consistent practice in order to boost your traffic. For more articles about increasing your website traffic, visit this page here. 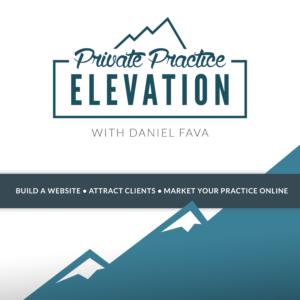 I hope you enjoyed our series on what to expect when working with a website designer to create a private practice website. Hiring someone can seem like a scary thing to do, especially when you don’t know what to expect. But hiring a professional is truly the best way to get a website you love that actually converts into paying clients. It also saves you a lot of time, frustration and takes the guesswork out of building an effective website. If you’d like to chat about how a new website could help improve your business, I’d love to chat. I offer a free 30-minute consultation. Learn more about custom website design. 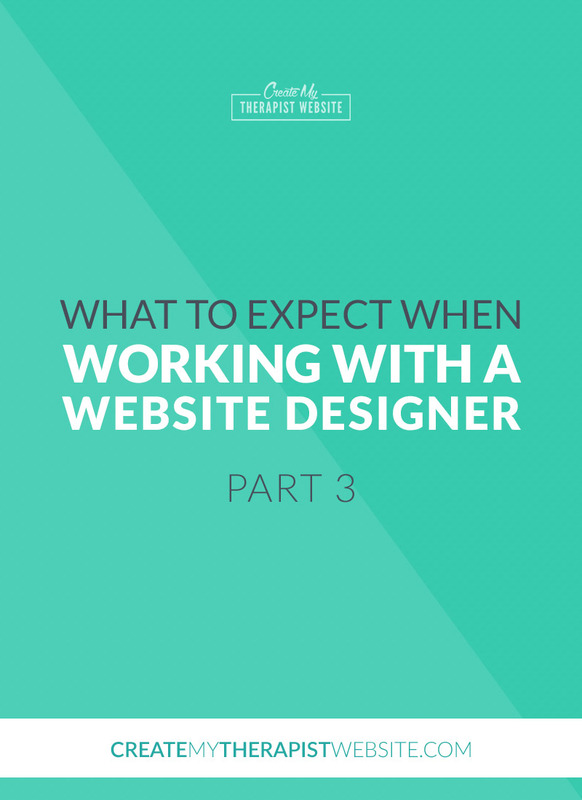 We’re continuing our series on what to expect when working with a website designer to build a website for your private practice. In Part I, we talked about everything that goes on before your website project actually starts: researching the right designer, the first call, getting a proposal and gathering your content. In this article, we’ll go over the website-building phase and everything that goes on while your designer is making magic happen for your private practice website. Ok, the big day has finally rolled around. It’s your project start day! By now, you should have wrapped up your responsibilities and delivered all your content to your designer. I like to have all these assets (copy, photos, logo, design preferences, etc.) about two weeks prior to your project start day. I’ll spend a couple hours organizing and making sure I have all I need to get started. If anything is missing, I’ll get in touch with my client via Asana, our homebase for the project. As your project begins, there’s really not a whole lot that should be on your plate, other than making yourself available to answer any questions your web designer may have. This is where the value of hiring someone really shines. You’re free to focus on your clients and other marketing activities you love, rather than fighting with trying to build a website. Enjoy this time and make the most of it! I can’t speak for all website designers, but in my projects, we build in two milestones where you can provide your feedback. The first time comes rather quickly, usually within the first week of the project. I’ll present you with a homepage and an about page design for you to review. I often like to record a video walkthrough of these two pages to explain certain design decisions and tell the story of how the design will help achieve the goals laid out at the beginning of the project. The reason we start with just the home and about pages is because at this stage in the project we’re making sure we’re heading in the right direction. This is where you’ll want to make sure the website feels right, is speaking to your ideal therapy clients and, yes, looks great. I’ll create a task in Asana where you can add your comments and questions for each page. Then, I’ll head back to my lab (home office) and make any necessary adjustments based on your feedback. After we’re both feeling good about the direction, the meat of the project can begin where I’ll start fleshing out all of the pages on the website and putting all the pieces together. Depending on the size and complexity of your website, this process may take 1 to 2 weeks. The second round of feedback comes after this phase, where you’ll be able to look over the entire website and we can discuss any concerns you may have once the content is in place. At this point we’re into the home stretch. Depending on the complexity of your website, it can take anywhere from 3 – 8 weeks to get here. Much of the work is still really in the web designer’s camp and you can continue being the amazing therapist you are while they’re hard at work getting everything in place. They’ll be making sure all plugins are working correctly, the website looks and functions well on mobile devices and assure everything is operational for a smooth transition to a live website for the world to see. If you have a website live currently, chances are that your designer has been building your website on a separate web host so they can work without interrupting your current website. At this point, I like to coordinate with my clients on a good time to finally “launch” the website and move all the files to your live website environment. I’ll make backups of both your live website and your new website (in case there are any hiccups along the way) and start moving your website files over. Once the files are moved to your live hosting server, it can take a few minutes to a couple hours for the website to refresh and appear. Open the champagne because a new season has begun! That wraps it up for what you should expect during the website-building phase of working with a web designer. If you and your designer have planned well, your biggest task is to make yourself available to provide feedback and answer questions from your designer as they come up. In our next post, we’ll talk about what to expect after your website is live to ensure a smooth handoff and make sure you get the most out of your private practice’s new marketing asset. Hiring a professional designer to create your private practice website is a great investment that can help you grow your caseload. But what does it look like to work with a web designer? In this article I’ll give you a behind-the-scenes look at how I work closely with my clients to create websites that are an asset to their private practices. Specifically, we’ll talk about everything that goes on before your website project begins. Because there are many phases to a website project, I’ll be sharing a few articles focused on each phase. If you’re thinking about hiring a pro to build your website, I hope this helps you know a little bit about what to expect before, during and after your website project. When you’re thinking about investing in a professionally built website for your private practice, it’s important you find someone you know and trust. I’ve heard too many stories about therapists hiring some web guy only to be left in the lurch with a website that doesn’t work and isn’t finished. I haaaaaate hearing that story over and over. A great designer should not only have good website skills, but also just common courtesy and relationship skills as well. In order to find someone who is the right fit for you, you’re going to have to have some conversations with potential designers. It’s the same as your clients. They often call around and speak to a few therapists before connecting with one they really believe can help them with their challenges. You’ve got some business challenges that a website designer can (hopefully) solve and you’ve got to find someone you trust. With any designer you’re thinking about hiring, there’s got to be that first call. 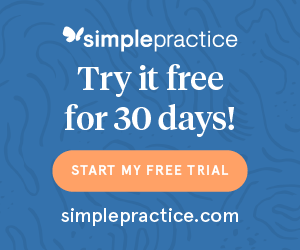 I’ve got a form on my website that folks can fill out that lets me know the context of their web challenges and what they’re facing in their private practice. Once I get that, we’ll schedule a time to chat. I like to use Zoom, a video meeting application, for these types of calls. There’s something about seeing each other that helps foster a more relaxed conversation as we get to know one another. This first call is your chance to see if the designer’s services and skill can help you overcome your private practice challenges. A website needs to help you solve a problem in your business. Do you need to convert more clients to raise your bottom line? Let them know this. Are you looking to branch out into more coaching and speaking gigs? Your designer will need to know this too! And I think a good designer will ask you questions that help you uncover your goals and understand your current challenges. Because when you understand your challenges more, you’ll be better positioned to decide how much you’re willing to invest in a website that helps you overcome those challenges. So that’s what that first call should focus on. Oftentimes, on that first call with my potential clients, we’ll also go over some details of the typical timeline and process that a website project will take. Getting into some of that information can help you uncover whether this person is organized and well-prepared to server his/her clients well. Once we have that first conversation together and it looks like my services and personality would be good fit, I’ll begin putting together a proposal. I’ve got a short form I ask my clients to fill out that helps capture some more specifics about their website and what they envision. Do they want to add an ecommerce shop functionality to their site? I’ll need to know that in order to provide the most accurate quote for the work involved. So once I get the answers to those questions, I’ll retreat into my web design lair and put together a very specific proposal for the client. A proposal should be the guiding star for the project. I use the proposal to clearly state what business goals this new website will hope to achieve. Along with that is what requirements does this client’s target audience need to be able to do on this new website. All of this guides the entire project and the decisions to be made. So, when you receive a proposal or quote, make sure you’re both in agreement, not just on what will be on the website (a blog or online scheduler) but the main goals or challenges that the website solves. Once I’ve decided on what it will take to solve my client’s challenges, I’ll price the project and send along this proposal and quote. Most designers, including myself, will require you to sign a contract and submit a down payment to secure a place in their calendar for your project. We designers have a lot of deadlines we need to juggle, so if we can’t count on your project being nailed down in our calendar, things get messy and no one wins. At this point, you can accept the proposal, sign the contract and submit your down payment for your website project. Ok, so you’ve signed a contract and put some money toward your project… exciting stuff!! So, do you just sit around waiting for your time to roll around on your website designer’s calendar? There’s plenty of work to be done leading up to your project. When I speak to therapists who may want to hire my services, I make sure to let them know this. Some folks want their website created and launched ASAP, but having a few months leading up to the project is actually a GOOD thing. As the designer, it’s up to me to organize the project and set a realistic timeline to deliver the website and solve my client’s problems. So I’ll spend some time after a project is locked in setting up all the required tasks and deadlines in my project management software called Asana. Asana is AMAZING. It lets myself and my clients know exactly what’s due when and lets us communicate and share files all in one place. I’d be lost without it. Another thing I’ll do is set up a Dropbox folder where you can begin uploading your content. Your main task leading up to your project start date will be to gather your assets together for your website. This may include working with a copywriter to create some killer copy that will convert your website visitors into paid clients. It may also include getting new portraits taken to help you create connection with your ideal clients. For me, this time is where I lend some feedback to my clients as they begin to pass along their content. I always have one main Dropbox folder where my clients can upload copy for web pages and photos they want to use on their website. I’ll look through their content and keep us on track so that we have all we need to begin the website project. It’s during this time that you as the client will be tasked with the most hands-on work. A great designer will keep you organized and moving forward toward your project start date. It’s your responsibility to provide what’s needed to begin your project. Most designers, including myself, will not begin your project unless they have all the content and assets needed to create your project. This allows your project to fit within the deadlines and scope of the work that’s been quoted. Once you’ve gotten all your content together and your project start date arrives, it’s finally time for the designer to get to work! I hope this article helps you understand what to expect when working with a designer on your new website project. In my next blog post, I’ll share with you what you can expect during the next phase of working with a designer to have your private practice website created. The next phase will be where the designer gets to work taking all you’ve delivered them and turning into practice-building online gold. I’m super excited to introduce you to another amazing counselor, Lisa Kendall. 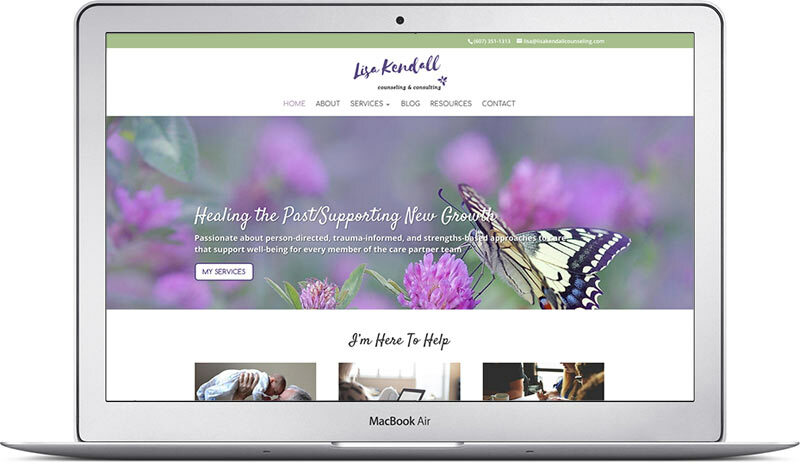 I had the pleasure of working with Lisa to breathe new life into her private practice website in order to support her growing counseling and consulting business. 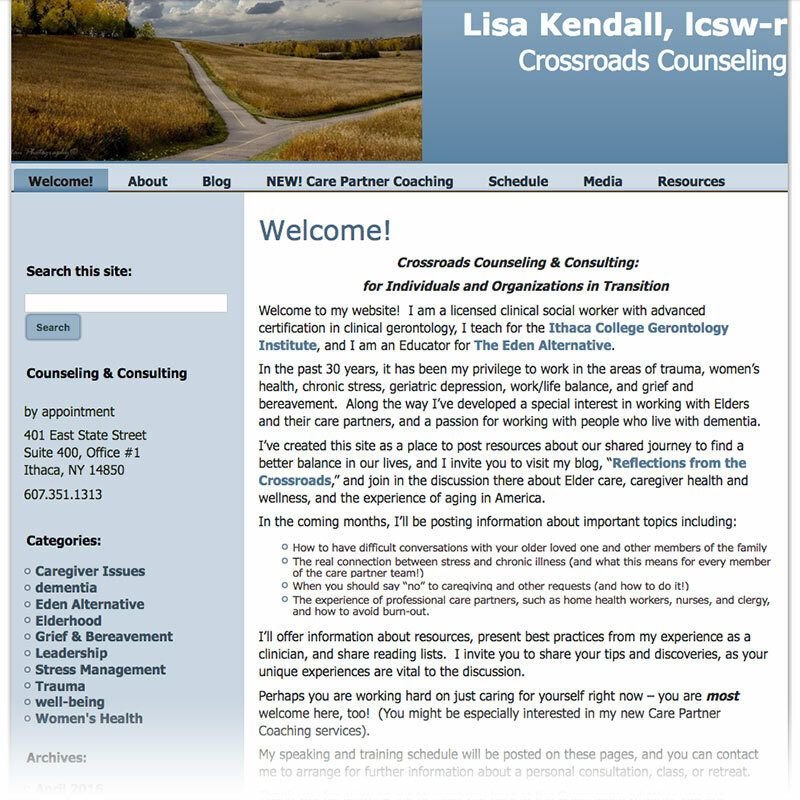 Lisa is a social work psychotherapist and gerontologist. Her passion is for working with elders and their care partners to create balance in their lives and cope with the challenges that may come from aging. I instantly admired Lisa because it was so clear how much she cared for the population she served. When we first chatted about what a new website could look like for her practice, Lisa had a clear vision for growth in both her business and her impact. With a growing community, coaching services and educational/speaking opportunities, she needed a website that would help her stand out, establish her as an expert in gerontology and attract new clients and opportunities. Her website looked more like an old-school blog, rather than a website for a counselor, coach and speaker. One thing Lisa did have? Great content and a warm and inviting tone to her copy. Because she knows who she wants to attract to her website (elders and their caregivers) she can write copy that speaks directly to their concerns, creating trust and warmth. So our challenge was to create a website that was more modern and let that warmth and personality come across. Her current website felt a bit cold and didn’t allow for much connection. So we went to work. We decided to start with one of my pre-designed Divi WordPress templates as a foundation for her website. Doing this helped save on the cost of her website and also gave us a great starting point that addressed some of the goals above. As with all my clients, I had Lisa complete a questionnaire prior to our work together. In the questionnaire, she was able to share with me the websites that inspire her, the feeling she wanted to evoke to her website visitors and specific preferences such as fonts, colors and the way she wanted her header to appear. I was able to take all that info, along with her content and get to work putting all the pieces of Lisa’s brand and content together into a new website. Lisa was truly a delight to work with and a model client! She was extremely responsive, uploading all her content to our shared Dropbox before the project began and providing all necessary feedback to me along the way. Because she was so readily available, we were able to complete the website rather quickly and launch it to the world. As you can see, Lisa’s new website is much cleaner and fully branded. 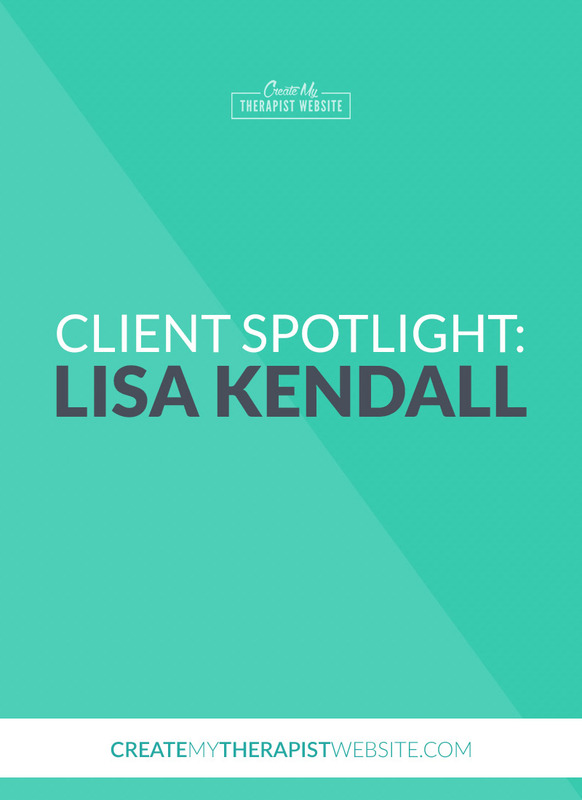 The logo, fonts and imagery all work together to create a brand for Lisa that evokes feelings of peace, rest and balance – exactly what she brings to her clients. The white space makes it easier for readers to digest her great content and learn more about who Lisa is and grow to trust her as an expert as well as a warm person. 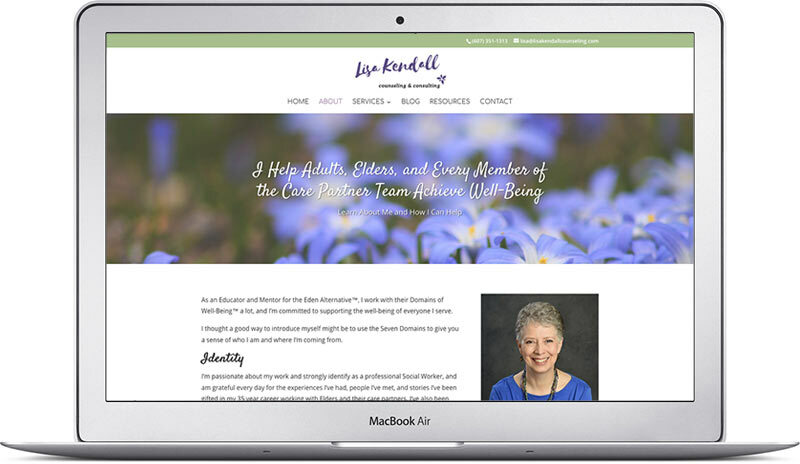 You can check out Lisa Kendall’s new website by clicking here. My new website really reflects my personality, and is ready to take me and my professional services to the nextlevel! It’s really beautiful, easy to navigate, and I believe I’ve already seen an increase in followers as a result. I would enthusiastically encourage colleagues to look at my website and to talk with Daniel and to trust in the fact that he’s a good listener, phenomenally well organized and well-prepared to walk people through what could be a painful process. He made it a joyful, collaborative, and creative experience. I am very grateful, and would recommend Daniel and his services without hesitation! Is It Time to Update Your Private Practice Website? One thing I love about my work is that I get to create change in a person’s life and business. And I’m not just talking about creating a new website. A website is nothing unless it is working for you and your private practice goals. It was an honor to help Lisa redesign her website into something that truly reflects her personality and lets her warmth shine. If you think your website is lacking in personality and isn’t helping you grow your practice, let’s have a chat. I offer a free 30-minute consultation where we can discuss your private practice goals, current challenges and how a new website could help move your business forward. Click here to learn more about how we can work together and to schedule your free 30-minute consultation. If you’ve been reading my blog for some time now, you’ve probably noticed that my work usually involves helping psychotherapists in private practice with their websites and online marketing. But there’s also been a growing number of physical therapists joining the CMTW community as well. 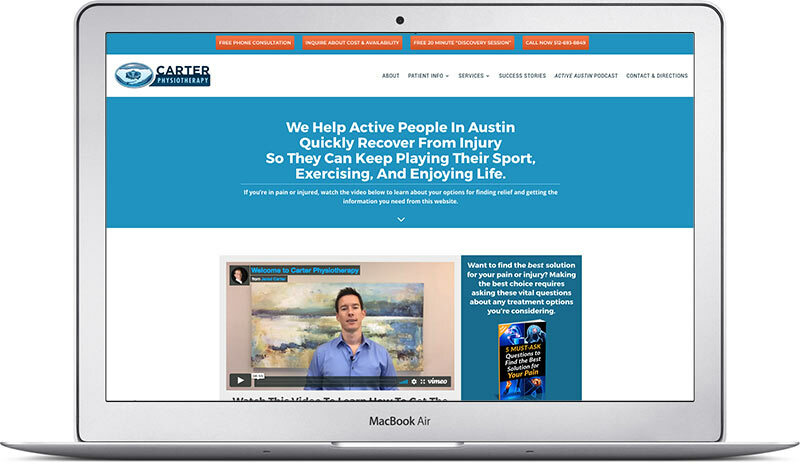 I recently had the honor of helping Jarod Carter, a doctor of physical therapy and certified manual therapist in Austin, TX, redesign and relaunch the website for his practice, Carter Physiotherapy. There were a few factors that made it prime time for Jarod to want to redesign the Carter PT website. When Jarod first approached me, his current website had been in place for years and was looking a bit dated. Not too much to it, right? Jarod and his team have done an amazing job in growing the practice and positioning themselves as experts in manual therapy, helping people heal from pain and injury and live active lifestyles. Their current website was not reflecting this expertise. They actually had a ton of great content on the website, it was just hidden behind the dated design. When your website feels dated, whether it’s the layout, colors or fonts, it can actually hurt your visitor’s impression of your professionalism. 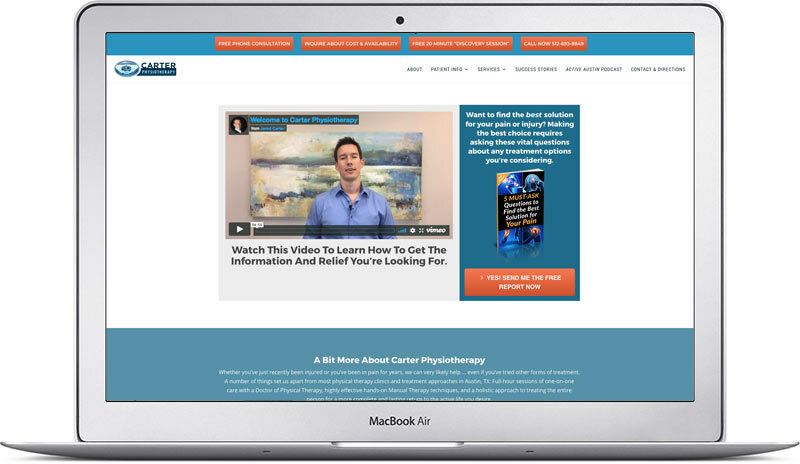 Carter PT needed a new, fresh look to let website visitors know right away – if you’re in pain, these are the guys that can help. They needed a website that would showcase their amazing content; informational pages and in-depth articles. Jarod Carter and his team have seen the importance of lead generation in growing their private practice. So, one goal for the new website was that it had to increase leads. Well, anyone who expresses interest in Carter Physiotherapy’s services by submitting a little info, such as an email address and phone number. This gives Jarod a chance to follow up with the potential client, whether that be with a free consultation or simply sending them a downloadable resource. The website had to make it easy for Jarod to start that relationship with his potential and existing clients. The way we pulled this off was to include a top bar with four options for folks to start a conversation with Jarod and his team. This bar is consistent across the website, so when a client feels ready to reach out, they can do it easily. The next thing we did was to feature 3 specific downloadable resources throughout the website that visitors could enter their info in order to download. 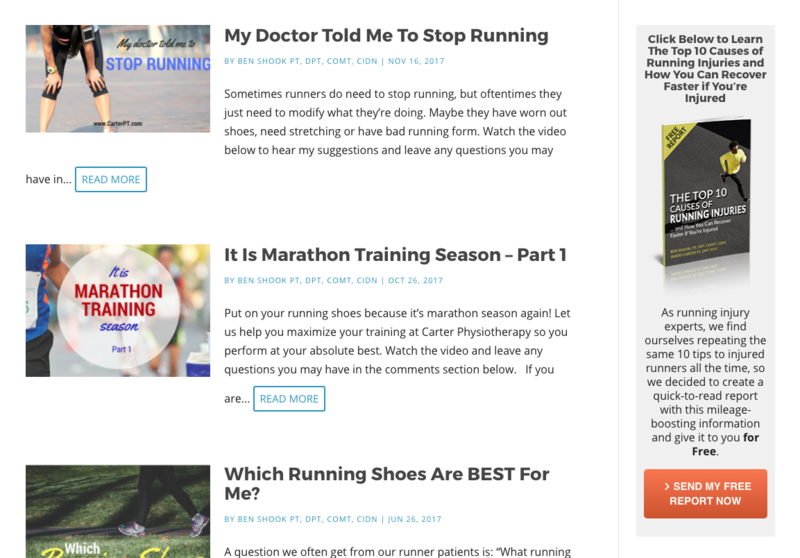 Because there were 3 PDFs, each covering a different topic (from general pain relief to avoiding running injuries) we were able to offer specific resources on specific pages. So if someone is checking out all the great articles related to running, there in the sidebar the user will find an opt-in form to get a related resource. This is a great way to connect and serve an audience because they’ve already showed interest in the topic, now Jarod is giving them a chance to learn more and connect with him as an expert. And as far as actually collecting the potential client’s info, we used LeadPages (affiliate link) to create LeadBoxes that pop up when the user clicks the button or exits the web page. This means that no matter what page the user is on, they’ll have an opportunity to get more information and connect with Carter Physiotherapy in a deeper way. 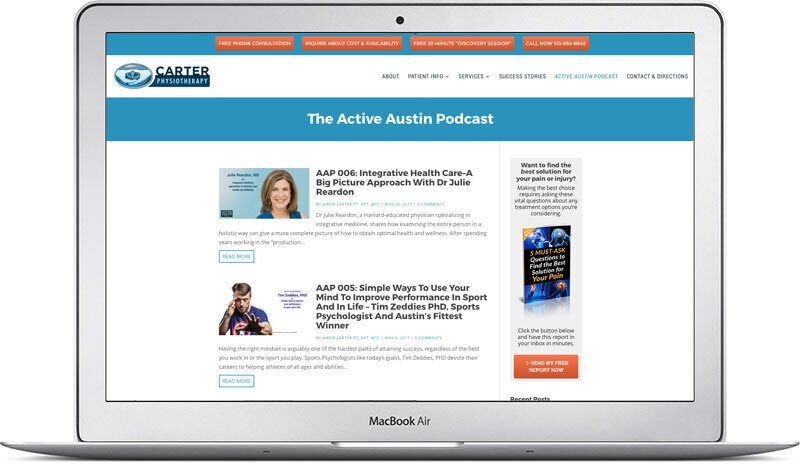 Another factor that was the impetus for Carter Physiotherapy’s need for a new website was the upcoming launch of their podcast, The Active Austin Podcast. Jarod needed a home base for the podcast where they could share audio and include show notes and extra resources to go along with each new episode. Not only is this a huge value to the people visiting the website, it’s also GREAT for SEO. With each episode of their podcast they have fresh content to optimize for search engines. Over time, this will pay off with more and more traffic coming from Google. As always, each project starts with a conversation where myself and the client can chat about their business and see if we’re a good fit to work together. My goal for these conversations is to get down to the core of why someone needs a website. And when you drill down, it’s SO much more than just wanting a prettier website. It really comes down to “what goals do you have for your business?” and then seeing how a website can help you achieve those goals. When I first met Jarod I really appreciated the vision he had crafted for his private practice. Once I knew his vision, it became my job to create a website that would help him achieve it. Because of the many opt-ins, forms and great content we had to showcase with this website, I learned a LOT more about the ins and outs of Divi and took customization to a new level. It was challenging, but it was fun. I’m really happy with how the website came out and excited to see Jarod and his team using it as a marketing hub to increase their leads and grow their practice. “I’ve worked with a number of web designers in the past and working with Daniel was an absolutely incredible experience. Unfortunately, there are a lot of web programmers/designers that promise the world and then deliver very little. With Daniel, he did everything he said he would do, has a fantastic sense of style and design, and always implemented 100% of my revisions/feedback in a very timely manner. 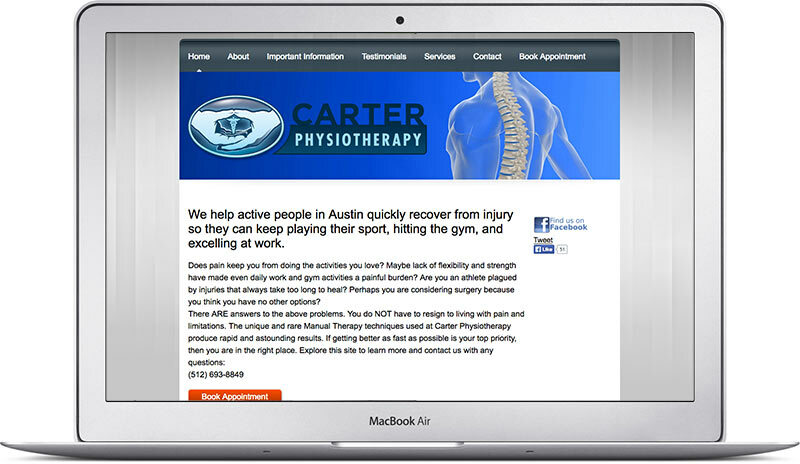 Click here to visit carterpt.com and explore the new website. 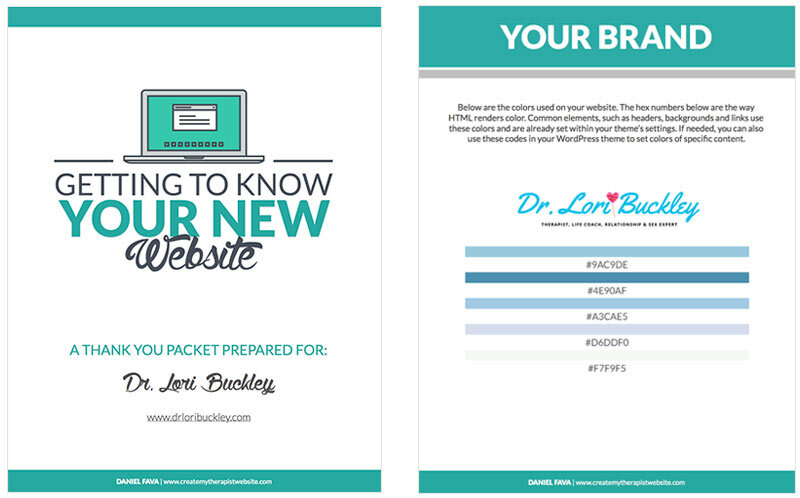 Is Your Website Working For You & Your Private Practice? As a website designer, seeing my clients use their new websites to propel their business forward is my greatest reward. It was an honor to be able to bring Carter Physiotherapy’s website to life and create an asset for marketing their business. If you’re website isn’t growing your practice the way you know it could be, I’d love to chat.